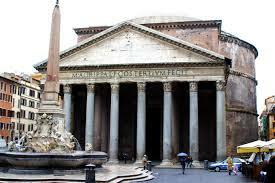 Pantheon, the first building was erected in 27 B. C. by Marcus Vespasiano Agrippa, the faithful advisor of Augustus. In Trajan’s time, the temple was completely rebuilt by Hadrian between 118 and 128, in thè form we still see today. The inscription on the frieze of the porch,Marcus Agrippa, son of Lucius, consul tertrium fecit, was therefore placed there by Hadrian who never put his own name on any of the monuments he built. If you haven’t already stumbled on thePantheon by chance, follow V. dei Pastini west out of Piazza di Pietra into Piazza della Rotonda, a sloping outdoor drawing room, with a lovely Renaissance fountain at the center surrounded by gelato-eating tourists who can’t take their eyes off the most extraordinary building of all antiquity, the Pantheon . The inscription over the portico-M. AGRIPPA. L.F.COSTER­TIUM FECIT(Marcus Agrippa, son of Lucius, Consul for the third time, built_this)-incorrecdy credits the Pantheon to Agrippa, whose earlier “temple of all the gods” was part of a vast 1st-c. B.C. complex. It is to Hadrian we owe the present Pantheon, which dates to 125 A.D., and to its 7th-c. consecra­tion as the church of St. Mary and All Saints we credit its survival. Like most Roman structures, it was cannibalized over the years-its dome stripped bare in 655, the bronze of the portico’s beams carted off to be melted down for St. Peter’s baldacchino and Castel S. Angelo’s cannonballs-but its perfect proportions are unchanged, its massive columns still stand, and its astonishing hemispherical dome-whose 140-foot (43-meter) diameter inches out St. Peter’s, for which it served as model-still soars above the marble floor. and contains an exceptionally rich collection of art, including works byDuccio, Michelangelo, Perugino, Bernini, and Lippi and a 15th-c.
Fra Angelico, the 15th-c. artist, and St. Catherine of Siena, who in 1376 persuaded Pope Gregory XI to return to Rome from Avignon, ending the 74-year “papal captivity.” (A diagram at the back of the church makes it easy to identify major works.) 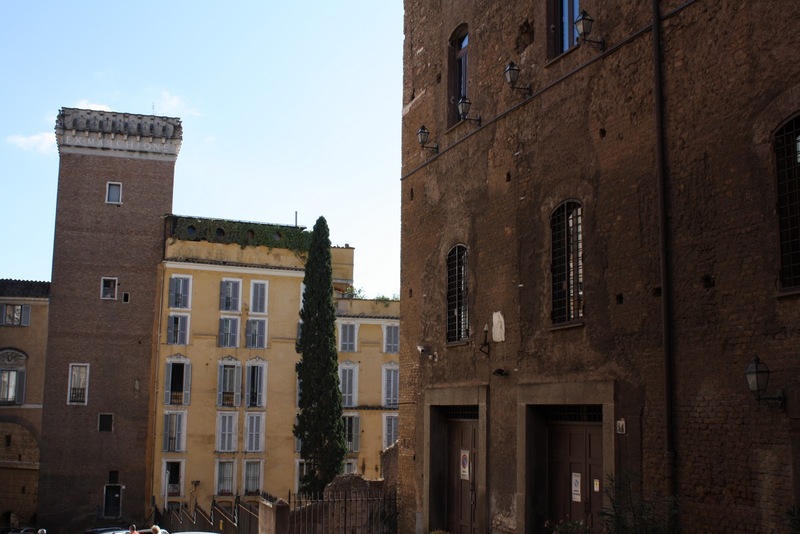 Turn left as you leave the church, right on V. di S. Chiara, and continue through Piazza dei Caprettari to the Piazza and church of S. Eustachio, a 1st-c. martyr who was roasted alive with his family. A stag’s head, Eustachio’s symbol as patron of the chase, can be seen at the top of the church. Facing it is the Palazzo di Tizio di Spoleto , whose frescoed facade depicts the life of S. Eustachio.